"The first generation of over-simplistic sleep tracking is over. It's done, it's gone, it's dusted." So says Circadia founder and CEO Fares Siddiqui who I met at London's Makerversity campus to talk about why Fitbit, Johnson & Johnson and mattress startup Casper are interested in what his small team of designers and engineers thinks comes next. He points out that the 'sleep aid' industry, which includes everything from pillows to drugs to devices, is set to be worth $80.8 billion by 2020 but wearable and nightstand sleep trackers are "really struggling" because "you need a sleep aid not just a tracker." Enter Circadia. The five-person sleep tech startup and its sleep science advisers are split between London and San Francisco. 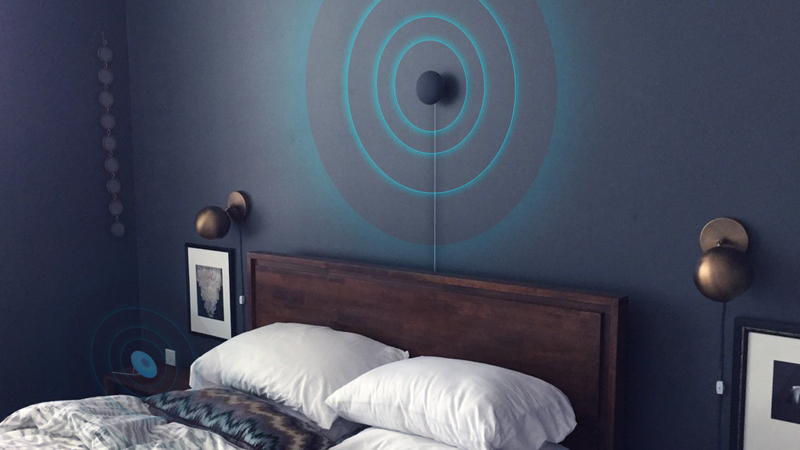 It just raised $200,000 on Kickstarter from 1,000 backers with its pair of devices, a $129 sleep tracker that you can mount on the wall or place on your nightstand and a light therapy lamp. Now on Indiegogo InDemand for "a few months" before sales start on Circadia's own site, you can buy the tracker separately or the whole system for $229. As to who will benefit from learning about and modifying their body clock, aside from those who suffer from jetlag, Circadia is focusing on anyone with "acute and chronic insomnia, sleep apnea and delayed sleep phase syndrome", the last one being a natural inclination to go to bed later and wake up later, which affects up to a third of people. 50-55% of customers so far are women and Siddiqui says the data indicates that women are generally more sleep deprived than men, especially if they have children. Circadia is due to begin raising a seed round in late September and Siddiqui describes its technology, which can track two people in the same room, as "a leap forward" from similar sleep devices like the ResMed S+. Here's how it works. The tracker's sensors emit ultra-wideband electromagnetic pulses (weaker than a Wi-Fi signal and FCC certified) which are transmitted back to the device by your body. It creates a map of your body, focusing on the chest and abdomen and then measures respiratory rate and heart rate based on small movements of your chest wall - "microns, very, very tiny movements" as well as tracking tossing and turning and larger body movements. In a small scale study of 14 people, compared to polysomnography machines in the lab, Circadia has a 98% accuracy rate for respiration and 90% for sleep stages (awake, light, deep, REM), which is impressive. Siddiqui says the team has the heart rate accuracy rate but is not sharing it yet as more tests need to be done - they are publishing a paper on detecting heart rate variability very soon too. "We use this sleep staging data and we convert that into a model of your circadian rhythm, your body clock, and we do that using AI and machine learning," says Siddiqui. "We have this light therapy device that you plug into your laptop and you get an automated, personalised light therapy program to help you readjust your body clock so that you sleep better or re-sync your clock." The lamp is designed be used at arm's length, at the two o'clock or ten o'clock positions, and at various points in the day - blue light in the first two hours when you wake up, white light during the day and when you need an energy/productivity boost and red light in the last 90 minutes before you go to sleep. Essentially, blue and white light boost cortisol and suppress melatonin production, which makes you feel more alert; red light boosts melatonin, which makes you feel sleepy. The lamp is configured to an intensity that actually shifts your body clock too, not just to counteract shifts from gadget use like Apple's NightShift mode and Flux software. Interestingly, Circadia wants to offer a range of options to help you manage your body clock shifts if you don't want to try the light therapy lamp. So it will offer a subscription to cognitive behavioural therapy within the app as well as free (at least at first) relaxation and meditation exercises and auditory tones packages via the built-in speaker. There's also push notifications to help you make small changes e.g. "go out for a light walk between 8.43 and 9.25pm, have your lunch between this time and this time, don't have your cup of coffee between this time and this time." Siddiqui is confident the team can meet the Q2 2018 deadline to ship to backers because what he shows me are working prototypes that, in the case of the tracker, is also a semi-looks-finished prototype - which we'll be trying out soon. The team actually delayed the crowdfunding campaign from this January for that reason. Circadia's founder himself, who has delayed sleep phase syndrome and gets jet lag from zipping between San Francisco, London and Shenzhen, found that after six weeks of using the current prototype (plus sheer willpower) he got down from four cups of coffee a day to one a day. The proof of this new circadian rhythm system on our energy levels, though, will be in the tracking, the algorithms and the results - plus collaborations with the likes of Fitbit who Siddiqui is already in "broad" talks with. "These standalone energy and SAD lamps already exist but people don't know how or when to use them," he says. "The entire objective of tying it together is to create a closed feedback loop where you can constantly show how the therapy program is being modified based on your daily schedule. We're obsessed with light because light is the single biggest external influencer behind our body clock. It's the reason why we feel happy on a sunny day and we feel gloomy when it's raining outside."